AFSA is proud to maintain the memorial wall plaques in the Department of State's C Street lobby, which honor our colleagues who have given their lives in the line of duty. The first memorial plaque, now at the west end of the diplomatic lobby of the Department of State, was unveiled on March 3, 1933 by Secretary of State Henry Stimson at the entrance of what is now the Eisenhower Executive Office Building, standing next to the White House, which then housed the State, War and Navy Departments. The inscription on this plaque states: "Erected by members of the American Foreign Service Association in honor of diplomatic and consular officers of the United States who while on active duty lost their lives under heroic or tragic circumstances". The establishment of this plaque grew out of efforts in the late 1920s and early 1930s to establish a "Roll of Honor" naming those who had died by violence or other causes related to service abroad such as tropical diseases. The first name is that of William Palfrey, chosen by the Continental Congress as Consul General to France, who set sail in 1780 and was never heard from again. Travel by sea was dangerous and often fatal in the early years of our country, and tropical diseases also frequently struck down 19th century American representatives. Who Is Honored on the Plaques? The first plaque was limited to Foreign Service officers, but after World War II the plaque became open to Foreign Service personnel of all ranks. The second plaque erected in 1972 at the east end of the lobby, during the Vietnam War, carried a new inscription: "Erected by the American Foreign Service Association in honor of those Americans who have lost their lives abroad under heroic or other inspirational circumstances while serving the country abroad in foreign affairs." This phrase was interpreted to comprehend the distinctive dangers, including terrorist acts, of life and work in the Foreign Service. Disease was generally no longer considered after World War II, and terrorism became the chief cause for inscription. In 1982, eligibility was extended to include U.S. Government employees of other agencies serving at embassies, including military personnel. However, in 2005, due to the sharp increase in the number of non-Foreign Service civilians serving abroad from agencies that have their own memorials to fallen employees, the AFSA Governing Board re-instituted the original plaque criteria. In one other change, the AFSA Governing Board in 2001 established an additional criterion of “in the line of duty” to cover Foreign Service members killed during the official performance of their duties even if not due to terrorist acts. The criteria underwent slight revisions in 2011, 2014 and 2015; please click here to view the criteria. If you wish to submit a name for consideration, please fill out this form. There are 115 names on the west plaque and 135 on the east plaque, for a total of 250, as of May 2018. These Americans died in 66 different foreign countries, as well as at sea. It must be emphasized that the names on the plaque represent only a part of the total number of Americans who die of various causes while serving their country overseas. AFSA owns and maintains the plaque. The AFSA Awards and Plaque Committee considers proposals for additional names and makes recommendations to the AFSA Governing Board which selects the final names for inscription, based on the criteria established by the Governing Board. 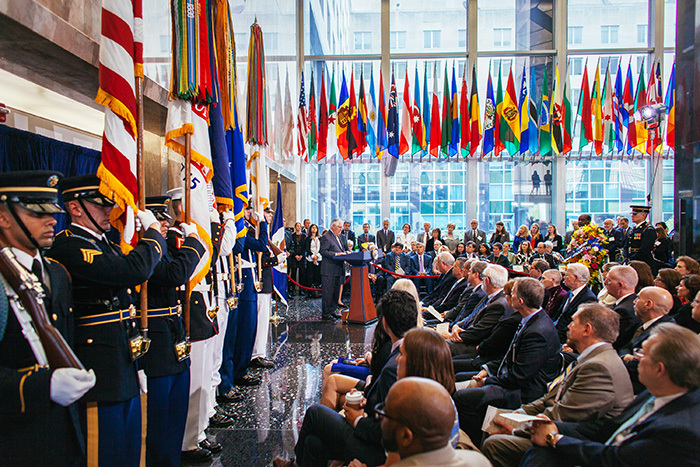 AFSA organizes unveiling ceremonies in cooperation with the Department of State when new names are added. The next ceremony will take place on Foreign Service Day, May 3, 2019. You may watch the 2018 ceremony by clicking here. Perri Green, Awards Coordinator, (202) 719-9700.